Heat oven to 425 degrees Fahrenheit. Spray bottom of an 18 x 13 rimmed sheet pan with cooking spray. In large bowl, toss cauliflower, 2 tablespoons olive oil, salt and red pepper. Spread mixture evenly in sheet pan. Roast 20 minutes, stir. Cook bacon until edges begin to brown but are still pliable. Rub pork chops with 1 tablespoon olive oil, sprinkle with thyme, rosemary and black pepper. 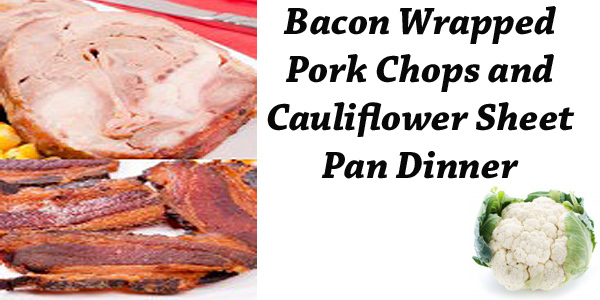 Arrange 2 bacon pieces over each pork chop and place in sheet pan with cauliflower. Tuck ends of bacon under each pork chop. Bake 9-11 minutes or until meat thermometer inserted in center of pork chops reads 145 degrees Fahrenheit. Garnish cauliflower with lemon peel before saving.